You might not have heard of Tony Benn, but his life and work helped define the country in which Jump! Mag is based – United Kingdom. A towering figure of British politics, he worked for over 60 years, first as Member of Parliament for Bristol South East and later Chairman of the Labour Party. Even after leaving parliament, he continued to make his views known, and was an extremely popular politician, both among Labour voters and supporters of other political parties. He died early this morning, at the age of 88 years old. The British Parliament is where politicians (MPs) meet to decide laws and make decisions for the United Kingdom. Parliament consists of the Queen, the [infopopup:houseoflords], and the [infopopup:houseofcommons]. Tony Benn was an elected MP, which means that he represented the voters of his constituency (area) in the House of Commons. When Mr Benn was a young man, there was a law that prevented [infopopup:Peers] from being MPs. On the death of his father, Mr Benn became Viscount Stansgate, and had to leave the House of Commons. He campaigned for years to enable hereditary Peers to be able to renounce their title, and returned to work as an MP after the Peerage Act was passed in 1963. ‘I have put up several plaques—quite illegally, without permission; I screwed them up myself. One was in the broom cupboard to commemorate Emily Wilding Davison, and another celebrated the people who fought for democracy and those who run the House. If one walks around this place, one sees statues of people, not one of whom believed in democracy, votes for women or anything else. Even after leaving parliament, Mr Benn continued to campaign on various issues, particularly in his role as president of the Stop the War Coalition. He was no stranger to young British people – he opened the ‘Left Field’ stage at popular Glastonbury Music festival in 2002 and spoke at each subsequent year since. 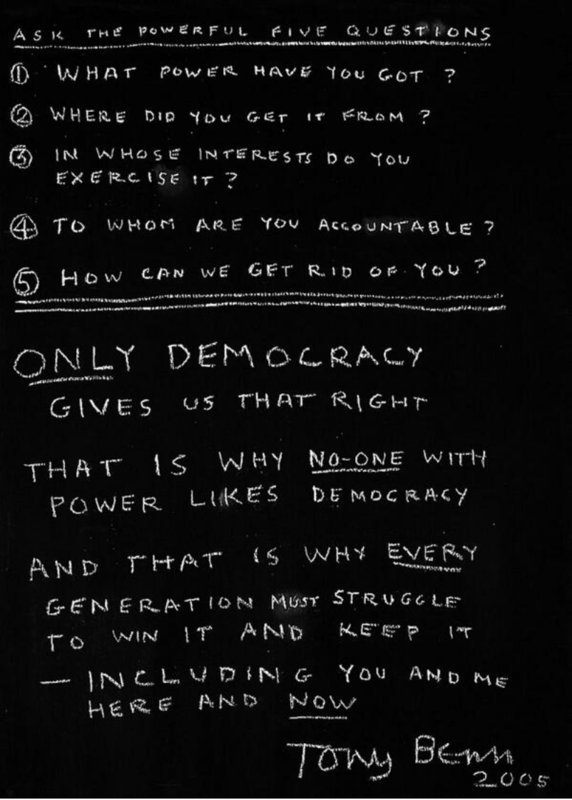 One of Tony Benn’s lasting legacies remains his ‘Five Questions for People of Power’, which he frequently spoke of during interviews and events. Featured Image via Twitter – Origin Unknown.